) as well as the United Nations Framework Convention on Climate Change (UNFCCC) are now using Show Your Vote to help visualize the world's public support of the upcoming Copenhagen Climate Summit, the COP15. 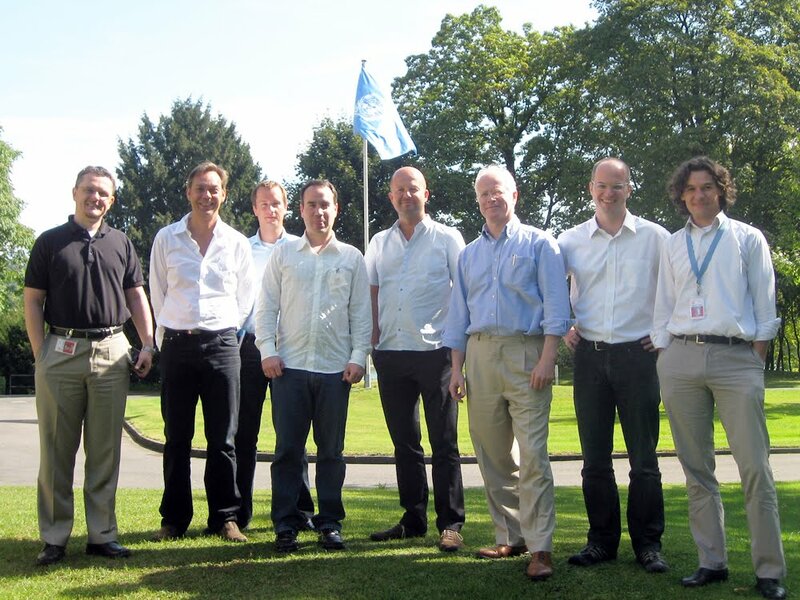 You can see all the ways in which you can participate in the COP15 from wherever you are in the world on their "Virtual participation in COP15" page. One of the big challenges around activating people on the issue of climate change is that there are a myriad of campaigns, big ones, small local ones, all over the world. I really wanted to address this issue, to provide a single platform that all campaigns and websites can use to collectively show the vote. So I developed a "web element" similar in function to Google's Web Elements, which anyone can insert to allow people to vote, show the vote and provide educational tools on their own website by simply filling out the publisher form, and copying and pasting a single line of HTML code. Google App Engine provides the hosting solution that makes this all possible. 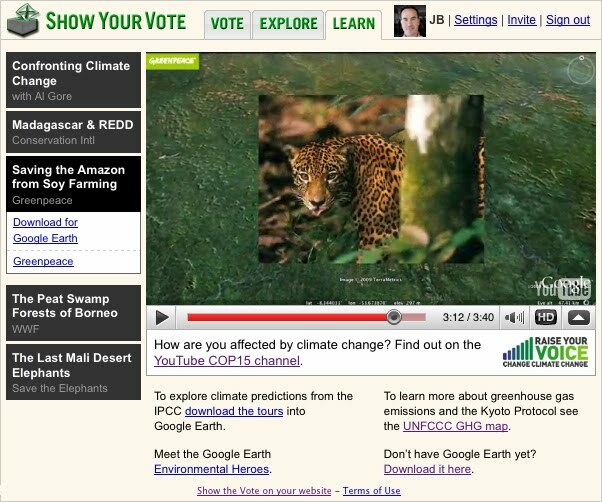 Show Your Vote has three tabs: Vote, Explore, and Learn. The Vote tab allows individuals and organisations to show their vote. The Explore tab displays individual votes aggregated by post code, and organisations by their own custom icons. 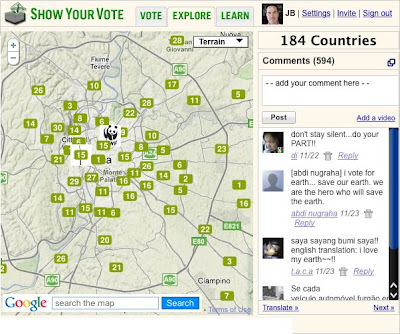 The voting map is powered by Google Maps API. Additionally, social networking tools powered by Google Friend Connect allow people within the global community to share their messages of support. Individual votes are aggregated into post codes, and organisations can upload their own icon to the map. In the countdown to the Copenhagen Climate Conference, I'm hopeful that we can collect enough of the world's public show of support to help amplify the need to change climate change, to drive collective action and to reinforce the need for our world leaders to act now. Please join me in helping to show the vote! I'd like to thank fellow Googlers Pamela Fox, Bob Aman, Rupert Breheny and Benjamin Kott for volunteering their time in helping to make Show Your Vote possible. One of the benefits working at Google is the ability to spend 20% of your time on projects you are passionate about. Recently I was lucky enough to attend the Australian Conservation Foundation's Climate Project Summit where I met Al Gore and was trained as a Climate Project Presenter. 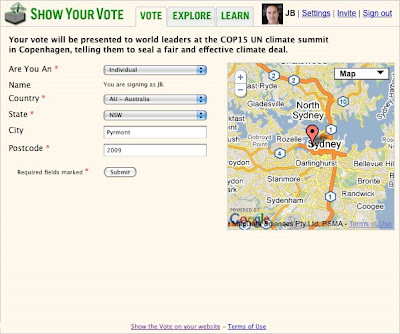 I developed in my 20% time an open source platform called Show Your Vote to allow people around the world to tell the world's leaders to seal a fair and effective climate deal. 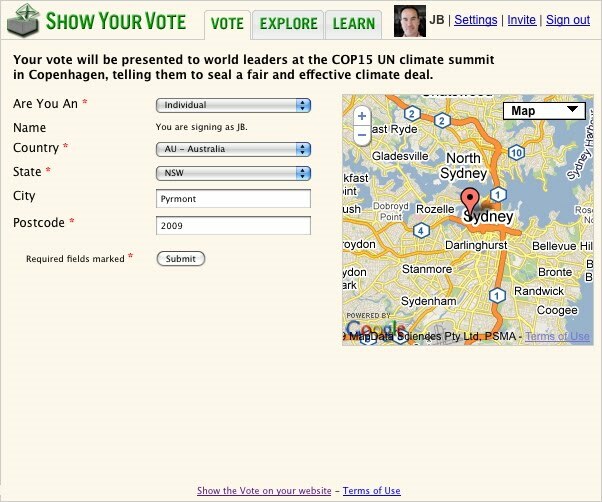 Some major environmental campaigns (including Earth Hour) as well as the United Nations Framework Convention on Climate Change (UNFCCC) are now using Show Your Vote to help visualize the world's public support of the upcoming Copenhagen Climate Summit, the COP15.